This post was originally published on Engineering for Change’s website and written by E4C’s Contributor Rob Goodier. View the original post here. 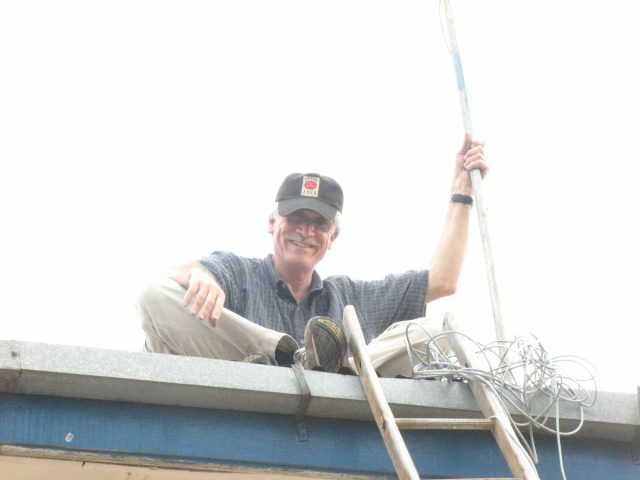 Bob Marsh installs WiFi antennas on the roof of a microfinance institution in the Democratic Republic of the Congo. Bob Marsh is a household name and the subject of dinner party conversations in a certain kind of household and select dinner parties. The kind populated that are popular among computer scientists and engineers. In the 1970s, Marsh was an early member of the Homebrew Computer Club, where members traded tech and tips, and Apple co-founder Stephen Wozniak went to people’s homes to help them build their own Apple I. Together with Lee Felsenstein, also a member of the club, Marsh designed and built the popular Sol-20 personal computer and began sales in 1976. Now Marsh’s work reflects the club’s theme, “Give to help others.” He is the co-founder and executive director of Inveneo, traveling to underserved communities around the world to install computer and Internet connectivity hardware. He recently helped to put 100 youth centers in Palestine online, and trained technicians to operate a Network Operations Center in Accra, Ghana, as part of the Ebola Response Connectivity Initiative (ERCI) project that serves Ebola medical centers and NGOs in Sierra Leone, Guinea, and Liberia. In all, he has worked in 15 African countries, Bangladesh, Haiti and Nepal. We asked Bob Marsh five questions. E4C: You once said that a key difference between rural Africa and rural America is Google. Have you seen an example of the Google advantage at work after you’ve provided Internet access? BM: Unfortunately, Inveneo staff rarely get a chance to return to project sites after completion. This is because we are usually sub-contractors for larger NGOs that are responsible for the M&E phases. 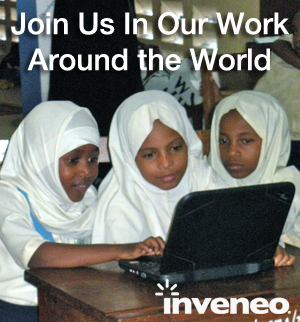 Anecdotally, I personally have seen people in rural Kenya, Burkina Faso and Botswana using Google at project sites. However, I don’t remember what they were searching for. My point was that it’s quite difficult to get information from outside one’s own rural community without Internet access, but that we here in the rich countries now take for granted (and hardly think twice about it) access to a vast array of information on any subject. E4C: Would you tell us a little about the hardware that you’re installing in developing countries? BM: Originally, back in 2005, we were building our own low power consumption 12VDC battery-powered computers using VIA motherboards. These had rather low CPU horsepower, but enough to run a Linux desktop and server. We found a number of 12VDC LCD monitors to pair with the VIA PCs. The next year we found a thin-client PC made by Wyse that was very small and inexpensive and we created our own Linux distro to run in just 128MB of memory. By late 2007, low power computing had become somewhat mainstream, and we found an AMD-powered unit made in Taiwan that would run either Linux or Windows XP or 7. This unit was considerably more powerful than the Wyse and could include a 16GB 2.5” hard drive or 4GB SSD storage. By 2009, Taiwan’s Asus began making very low power complete systems that included Windows 7 for reasonable prices (as low as $255). Inveneo used various models of the Asus eeeBox series for several years after that, plus some very low power LED/LCD monitors from Asus. However, for the past two years, we’ve been more involved with tablet-based projects, primarily using the Google Nexus 7 series, also made by Asus. E4C: What are some of the obstacles in hardware installations that you face now? BM: Printers remain a challenge. While laser printers have the lowest cost per page, they use a lot of power. Inkjet printers can use very little power, but often use a lot of expensive ink cartridges. Either complete lack of electricity, or poor quality electricity from the national grid. High heat and humidity, or even worse in many cases, lots of dust. Lack of knowledgeable technical support people outside of the capital city. Lack of broadband Internet access at an affordable price. E4C: What are some of the improvements that you’d like to see in the technology that you work with in developing countries? Frankly, a lot of the challenges are more software related, e.g. more comprehensive materials that follow a country’s curricula, software to track pupils progress and attendance, as well as teacher performance. E4C: Do you have a story from your work that gives a glimpse of a day in your life on the road? BM: Local knowledge is always valuable, but we learned early on to remain skeptical. In Western Uganda, we did a project to connect houses in 5 villages to an Community Center office near the highway (a very dusty dirt road) that had an Internet connection. Each house would have a low power computer, solar panel and battery, with a long range wifi radio to access Internet and a local VoIP service. We only had a hand drawn map showing the various neighboring villages, as they were not shown on any other paper or online maps. One targeted village was 1000ft up on the slopes of the Ruwenzori Mountains nearby, but there were a number of similar looking villages that could be seen with the naked eye or binoculars. So we asked three different local people to point out which village was the correct one, and received three different answers. Ultimately we sent people up to the village, who had to walk up steep path, as there was no road. Even with binoculars from the They used a mirror to flash their location to some of us at the bottom of the hill, and we found that the correct mountain-side village was none of the three that the locals had pointed out! Worse, that target village could not be seen from the Community Center, and as the radio links needed direct Line-of-Sight, we had to completely re-configure the whole network to find a way to reach the mountain-side village.